Have I ever mentioned that I can be a bit lazy when it comes to organizing elaborate and crafty learning activities? I think I have. Have I ever mentioned that I’m too cheap to buy “educational” electronics or apps? I think I have. (Also, I think they are annoying.) 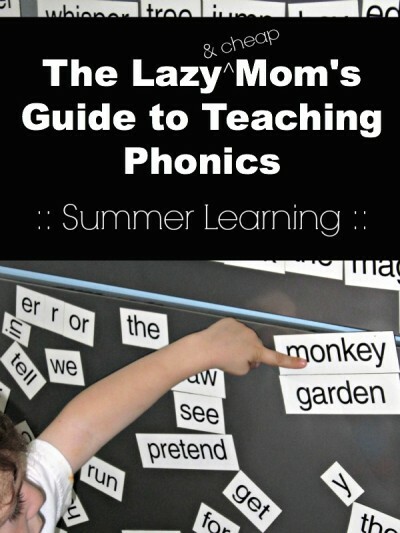 I present to you: The Lazy Mom’s Guide to Teaching Her Child Phonics. 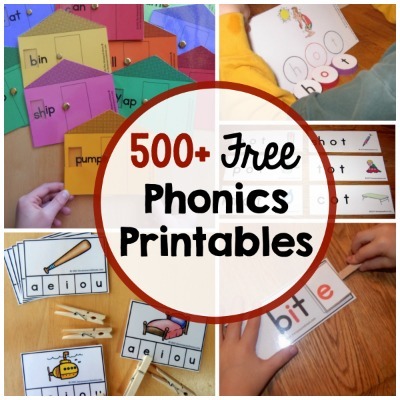 Use an alphabet puzzle to practice and introduce phonic sounds. Kid (giggling): No! Mommy! Truck! Not duck! Mommy (putting finger on the letter T): Oh, yes. You are right that is a “t” not a “d”. How could I be sooooo silly? “T” is “tttttt” sound, not a “ddddd” sound! Add a lot of simple rhyming games to your everyday life. I love this idea for a rhyming walk from The Pleasantest Thing. You’ll be taking lots of nature walks in the summer, right? Even lazy moms like me can manage that. Recite tongue twisters. Tongue twisters are also excellent distraction tools when your kids are going insane getting antsy in public. Alliteration is great for phonics understanding. Let you child play with Scrabble tiles or a Boggle game. They can sort letters while you make the sound. Or just drink your coffee chai while they stack them up. That works, too. Try a frozen word hunt in the bath. This does take a bit of planning but is still very easy. And of course… read, read, read. *Pictured is the Magnetic Poetry Kit – Really Big Words , which both boys love playing with. 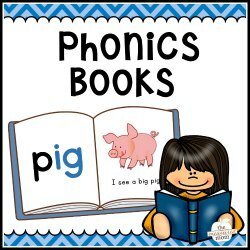 For those of you who like more structured phonics activities, I love, love, love the resources at my friend, Anna’s site, The Measured Mom. Click on the image below to get all her amazing resources! Thanks for these fab ideas. I love the frozen word hunt. I will definitely try that one. Our favourite phonics game is “running reading”. I write the letters on cards and place them in the hallway. My son then runs to get the first one, brings it back and says the sound, then runs for the next one. I think they are called shuttle runs in PE class! At the end we always have a prize (usually a toy he loves already, nothing new or expensive.) He loves the race element of it. It is easy to extend using sight words or using the letters for one word that they have to puzzle out at the end. Oh, that sounds like great fun, Judie! I can’t believe New Kid is entering K. Time does fly! These are such fun ideas! My kids would think it was so funny if I messed up words while reading. My youngest two are starting kindergarten this fall too, but aren’t quite reading yet either. My oldest, like your oldest was reading chapter books by kindergarten. Maybe we had more time to work with them? I still see them eager to read books with me and love it, so I’m still hopeful that they will be avid readers. I remember a relative saying to me that “the older ones are always smarter because moms spend more time with them”! I’ll be spending more 1 on 1 time with my 4 year old this summer while his brother is at camp so hopefully I can even the score! LOVE your “lazy” ideas. They are really fun and my kids would have loved them. Too bad they can read already! I feel liked they totally missed out on the silly wrong word reading. Did you realize your lazy post is making me feel badly about myself? Clearly I wasn’t lazy enough! LOL! I have always read to my kids and this year I am planning to home school my youngest son and my biggest goal is to have him reading by the time he should start kindergarten next year. This program seems to be in line with helping us reach this goal. Thank you so much for making it known. I came across educationalfun.info.which I think is an amazing reading program that will hopefully help my son as well.